Ethiopian favorite Tsegaye Kebede dominated the 35th annual Chicago Marathon—running a personal best in 2:04:38 to set a course record and become the first man ever to go under 2:05 there. It was the second year in a row that the course best had been toppled—last year Moses Mosop of Kenya improved it to 2:05:37 hours. On Sunday, the 25-year-old Tsegaye ran the tenth-fastest 26.2 miles of all time, not counting unofficial times from the Boston Marathon. Tsegaye became the first Ethiopian man to ever win the event. 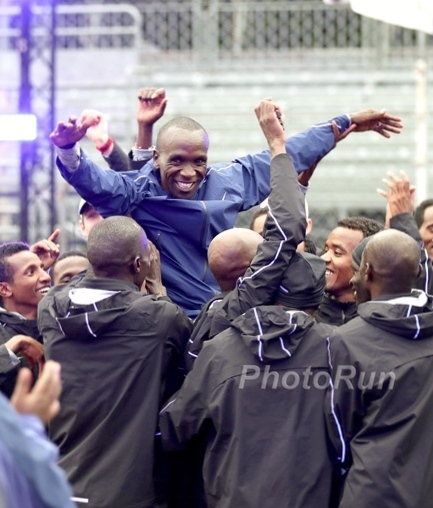 For the past nine years, the champions had come from Kenya, but this year Ethiopians swept the top three spots, with Feyisa Lilesa (2:04:52) and first time marathoner Tilahun Regassa (2:05:27) taking second and third. Another debutant, Sammy Kitwara of Kenya, placed fourth in an outstanding time of 2:05:54. The next two finishers also ran very good times—Kenyan Wesley Korir capturing fifth in 2:06:13 and his countryman compatriot, Bernard Kipyego, crossing the finish line next in 2:06:40. The depth of the field was equally impressive. The top three finishers clocked Chicago’s fastest-ever times—and a record number of runners came in under 2:06. Eleven competitors broke 2:10, among them American Dathan Ritzenhein, the leading non-African runner, who improved his best by over two minutes to finish ninth in 2:07:47. He is now the third-fastest American of all time behind Ryan Hall and Khalid Khannouchi. The women’s race was also a triumph for Ethiopia. Atsede Baysa, 25, edged ahead in a sprint finish to win by just one second over Rita Jeptoo of Kenya in 2:22:03. Lucy Kabuu (Kenya) placed third in 2:22:41. The defending champion from Russia, Liliya Shobukhova, ran well to finish fourth in 2:22:59. Fifth position went to Caroline Rotich whose time of 2:23:22 was also a first-class performance. No fewer than eight women went under 2:30. Beginning in ideal conditions—temperatures of 42 degrees Fahrenheit and occasional light wind—a large group of 15 men went through halfway in 62:54 minutes. Once the pacemakers had dropped out, Tsegaye Kebede went to the front and dictated the tempo. At 30K (1:29:03) there were still nine runners behind the Ethiopian, who had maintained a relatively quick pace. Five kilometers later, the chase group was reduced to Tilahun Regassa, Sammy Kitwra, and Feyisa Lilesa. Ultimately, it came down to a duel between Tsegaye Kebede and Feyisa Lilesa. Both went through 40K in 1:58:02 and by that stage had a lead of 24 seconds. Two years ago, Tsegaye had reached this same point together with the late Olympic champion, Sammy Wanjiru, who eventually won the race. This time Tsegaye was able to force the pace over the last mile and drop Feyisa Lilesa. He finally crossed the finish line 14 seconds ahead of his compatriot. He had run the second half of the race in just 61:44. “I could not run two years ago with Wanjiru—but this year, this is my goal [to make sure it doesn’t happen again],” Tsegaye explained. “My dream is always to run 2:04.” The 25-year-old’s previous best was 2:05:18, his winning time in the Fukuoka Marathon in 2009. Tsegaye was only one second slower when he triumphed at the 2010 London Marathon in 2:05:19. The 2008 Olympic bronze medalist took a highly respectable third in the 2012 London Marathon (2:06:52). Tsegaye began running when he was eight. He comes from a family of 13 children who grew up about 25 miles from Addis Ababa. According to the Chicago Marathon’s Website, he earned about 30 cents a day as a young boy, collecting firewood and herding livestock to raise the money for his education. Liliya Shobukhova already had written a chapter of Chicago Marathon history with her three consecutive victories. At halfway, the nine-strong leading group had gone through in 1:11:15 and she was right up front and still in contention for a possible fourth triumph. But by 30K, the Russian defender could not stay with the pace and ultimately placed sixth—five seconds behind the leading quartet. Kenya’s Lucy Kabuu, who ran 2:19:34 in Dubai in January, (the second-fastest marathon debut in history) led this group together with Ethiopian Fatuma Sado. With them in the front were Caroline Rotich and Rita Jeptoo. Atsede Baysa had dropped off the leaders and at 30K was alongside Liliya Shobukhova, five seconds behind. But, unlike the defending champion, she was able to come back, make up the gap and reestablish contact. Fatuma Sado could not maintain the pace and Atsede was still in front after 35K. Caroline Rotich was the next to lose contact but at 40K (2:14:45) three runners were still in the mix: Rita Jeptoo, Atsede Baysa, and Lucy Kabuu. Lucy Kabuu slowed with about one kilometer to go—leaving Rita Jeptoo and Atsede Baysa to battle for victory in this prestigious race right to the very last meter. 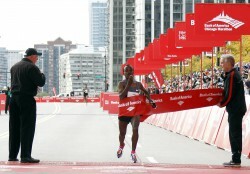 In the closest women’s finish in the history of the Chicago Marathon, the 25-year-old Ethiopian emerged as the champion by just one second in 2:22:03. “I am very happy because winning was a big dream for me. No words can explain,” said Atsede, who initially was given the same time as Rita Jeptoo. Both runners were recorded as finishing in 2:22:04. 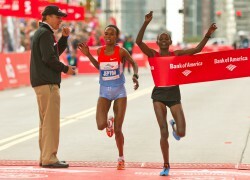 The fact that the winner’s official time later was corrected to 2:22:03 had special significance for Atsede, for it meant she had improved her personal best by one second. Her previous mark was established when she won the Paris Marathon two years ago in 2:22:04. This year, she finished eighth in Dubai and ninth in the London Marathon. Chicago 2012 became become her greatest triumph so far. 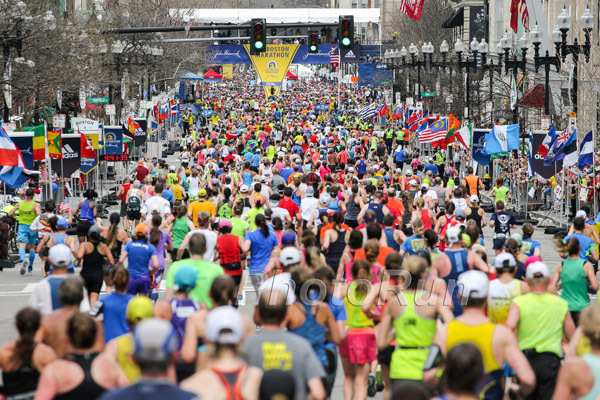 This is a race that is part of the World Marathon Majors (WMM) series and the coveted 45,000 entries were sold out within six days—an event record. 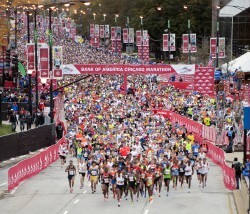 Runners came from all 50 states in the U.S. and 115 countries worldwide. Over 45 percent of the participants were women. 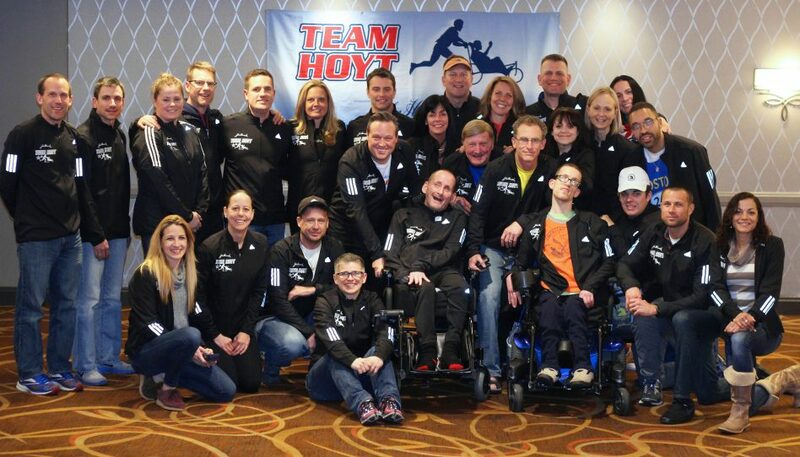 Approximately 10,000 athletes ran courageously for others, supporting 190 charitable organizations: more than $85 million has been raised for good causes in this race since 2002. 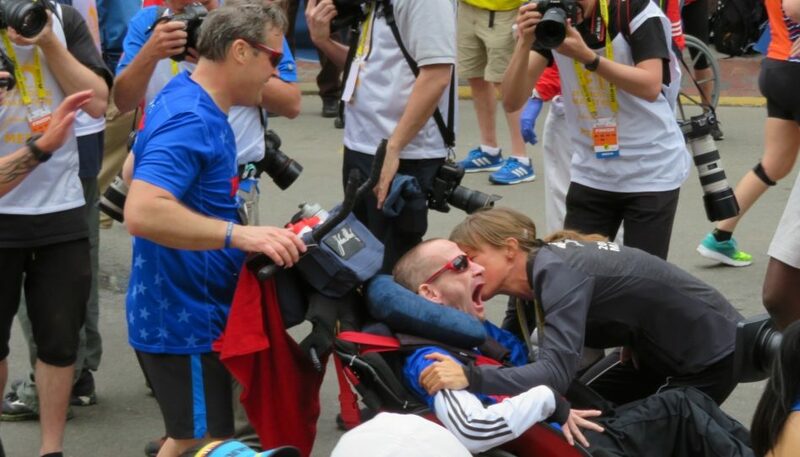 One of those charity runners was EJ Scott. The 36-year-old suffers from a rare eye disease, choroidermia, which will ultimately leave him without vision. 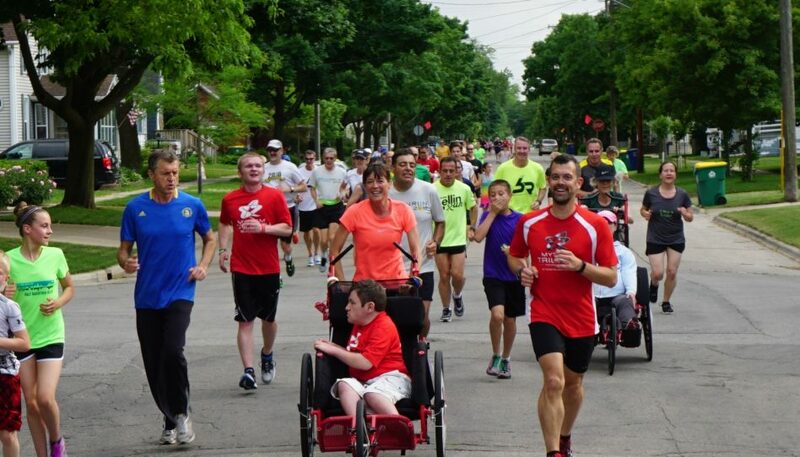 According to the Chicago Tribune Website, Scott hopes to raise $144,000 for choroidermia research by running 12 marathons in one year. On Sunday he completed his tenth. © Copyright 2012-2019 by Take The Magic Step®. All Rights Reserved.